Governments have been concerned about UFO sighting reports since WWII, but historians have never made a concerted attempt to understand their often contradictory responses to the phenomenon. How could something of such potential technological and national security consequence have left no visible trace in the history books? Whether it’s a conspiracy or not, the subject has been marginalized to such an extent that it’s as if the military never acted with alarm on the heels of a UFO sighting, as if the intelligence community never took up the issue behind closed doors, as if government research and development efforts never attempted to duplicate the phenomenon. But they have. 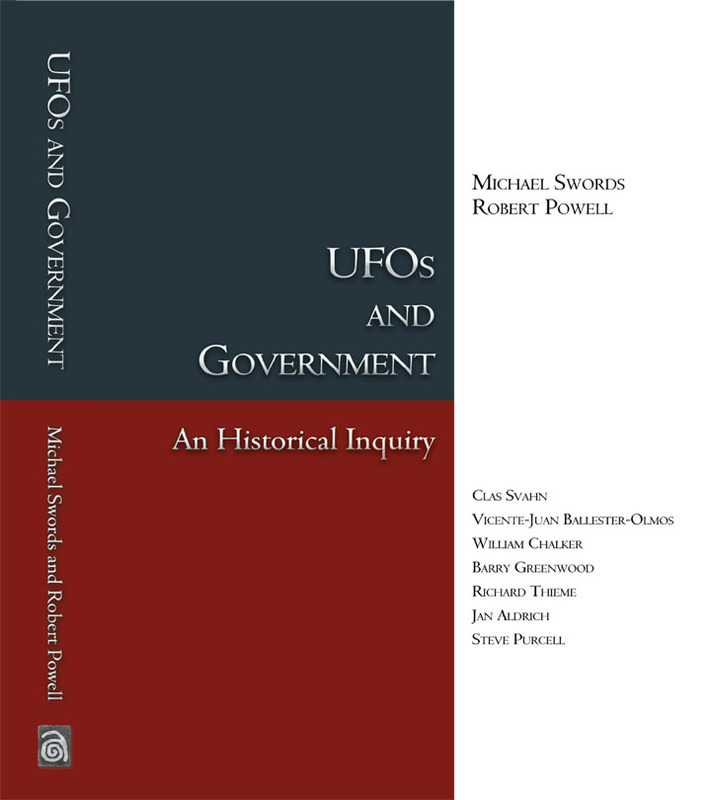 So now a collection of veteran UFO historians and researchers have attempted to address this historical oversight with the publication of a new book entitled UFOs and Government, published by Anomalist Books. The authors have spent more than four years researching thousands of government documents and archives in order to present a work of historical scholarship on the U.S. government’s bungling response to the UFO phenomenon. How and why the U.S. government—and other governments around the world—have dealt with the UFO phenomenon during most of a century is the focus of this historical inquiry. The remarkable story explains much that is new, or at least not commonly known, about the seriousness with which the military and intelligence communities approached the UFO problem internally. It also reveals how the subject became treated as if it were a triviality, and why the United States government deemed it wise to treat it so. 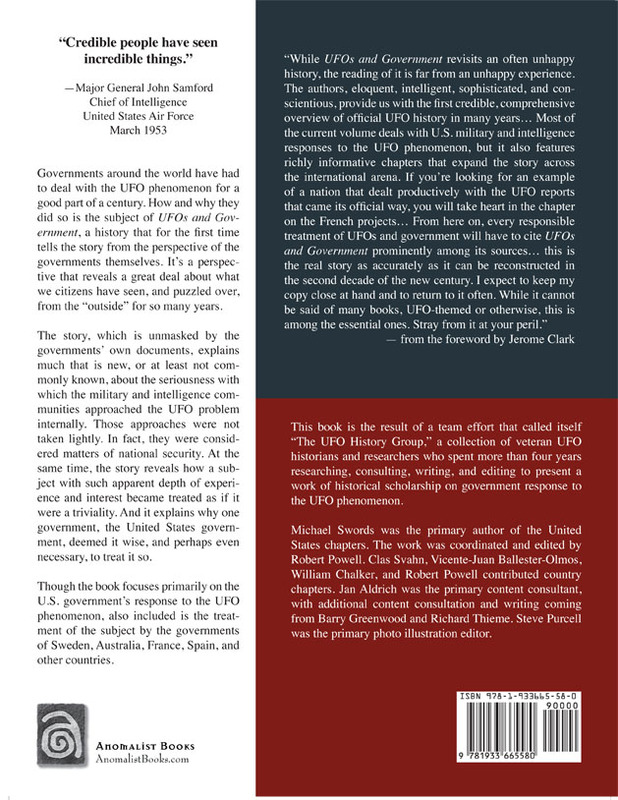 Though the book focuses primarily on the U.S. government’s response to the UFO phenomenon—revealing how bureaucracies fight amongst themselves, protect themselves, and in the end fail to serve the public—also included is the treatment of the subject by the governments of Sweden, Australia, France, Spain, and other countries. The book’s international cast of authors was headed by Michael Swords, a retired professor at Western Michigan University with an extensive knowledge of UFO history, and managed by Robert Powell, director of research at the Mutual UFO Network.